Several weeks ago, I wrote about my experiences with the D.C. Paid Leave Coalition, a great group of advocates here in D.C. who have now spent over two years trying to get the D.C. government to pass a fair and feasible legislation that guarantees paid leave to all employees of D.C.-based employers for pre-specified periods of time. I also wrote about how that legislation, called the Universal Paid Leave Act (UPLA), had been plunged into an existential crisis of sorts. Since then, I have joined my Paid Leave coalition friends for more visits at various D.C. Council Members’ offices and tried to stay on top of the latest developments. The most recent concerns about the future of the legislation involve a flood of new alternatives to the UPLA proposed by various members of the D.C. Council, including by its Chairman Phil Mendelsohn. First, the good news. The benefits that were originally proposed under the UPLA appear, for the most part, to be safe – 8 weeks of paid leave for new parents, 6 weeks to care for a sick relative, and 2 weeks to address the employees’s own health needs. The bad news? Second thoughts about its implementation. After months of debate and deliberation, the D.C. Council had originally approved a “social insurance” model to finance and implement the paid leave program. Under this scheme, all non-governmental D.C.-based employers would pay a small, incremental payroll tax (under 1 percent) that would be entered into a common pool to finance the benefits for all employees. The program would be administered and implemented by the D.C. government, a neutral third party. This financing model is similar to those adopted by successful paid leave programs in other states (such as California). But apparently its not good enough for some members of the D.C. Council, who appear to be turning their backs on the social insurance model. In recent weeks, several members have introduced alternative proposals such as the “employer mandate” model, in which employers are required to directly provide the benefits of the UPLA to their employees. In order to do so, they must figure out their own insurance solution and how to administer the program. It is not clear who will enforce the “mandate” and ensure that employees are actually provided the benefits they are promised under the law. So there are plenty of risks here. Some other Council members have proposed “hybrid” models, which involve a smaller payroll tax to finance and administer the program for small employers (who really need the insurance), but preserves the employer mandate for larger employers. Again, without a clear understanding of the enforcement plan, it is hard to assess how effectively the mandate would work. The reason for the reversals? It’s D.C.’s big business lobby that has always voiced the strongest opposition to the UPLA. After all, the reason the UPLA exists is because left to themselves, most employers chose not to provide the benefits required by the UPLA. So of course, many employers oppose the provisions of the law. But some members of the D.C. Council appear to be swayed by their opposition. And the employer mandate (or hybrid models that adopt some of its features) is being dangled as a carrot to appease big business. So let’s take some of the most common criticisms of the social insurance model and see how well they stand up to facts. Claim: Businesses really, really, really want the employer mandate. Seriously, all of them do. Wrong. Small businesses would struggle under the employer mandate and they fully recognize that they would. Small businesses do not have the resources to absorb big financial shocks. That’s why they need the insurance. For instance, suppose three out of ten employees in a small restaurant were to need paid parental leave in the same calendar year. In the low-margin restaurant business, the restaurant owner would find it tremendously hard to provide this leave to all three employees at the same time. But you know what the owner can do? Pay a small annual payroll tax to make its annual contribution to a common insurance pool that would cover all its employees’ family leave. Claim: The employer mandate is less costly for businesses. Almost certainly wrong. There is no proof of this and no reason to believe that state-provided insurance is more expensive than private insurance. In fact, it is reasonable to expect the opposite to be true (e.g., the social insurance model would pool risks for a bigger base of employees, which could lower costs). Which brings me to the following thought experiment: we are supposed to believe that employers expect to provide the full set of benefits required by the UPLA under all alternative financing scenarios. But doing so privately under the employer mandate model (or some form of the hybrid model) would likely cost employers more. So why do they support it? What do they know that we don’t? For instance, could they be betting on the employer mandate model because they don’t intend to fully comply? I don’t know about you but smells just a little bit fishy to me. The least the Council could do is to ask businesses to substantiate such claims: how exactly do they intend to provide all of the same benefits for lower costs? Claim: Small employers would not pay their fair share under the social insurance model. Mostly wrong. The social insurance model works like this: each employer pays a tax that is proportional to its total wage bill. This creates a common pool of funds that is then used to finance the benefits for all eligible employees. So if you are a mid-sized employer that pays higher wages, you will contribute more into the pool than a same-sized employer that pays lower wages. But that’s all fair and fine, because when the higher-wage employer’s own employees need paid leave, they have to be paid more. So employers are generally contributing in line with their expected benefits in the longer-term. (I say “generally” because employee demographics (e.g., age, gender) — and correspondingly, the amount of paid leave requested of the employer – may vary across employers. Its also true that the UPLA benefits are capped at a maximum allowed amount, meaning that the highest-wage employees will not be reimbursed fully for all of their lost wages when they take family leave. But there is no reason – and no convincing evidence – to believe that small businesses would derive systematically more financial benefits than big ones under the social insurance model). Claim: There is no evidence that a payroll tax-financed model would work better than the other alternative proposals. Extremely misleading. The states that currently provide paid family leave in the US – California, New Jersey and Rhode Island – do so through social insurance-like models. So it is kind of popular. To the contrary, there are no paid leave programs in the US that are financed fully by the employer mandate. So its not clear how one would empirically compare the performance of the alternative models. It’s kind of like saying that there is no evidence that life on Earth is better than life on Mars and then walking off feeling like a winner. Claim: The paid leave benefits would be the same under all financing models. So just chill out, everyone. Misleading. In theory, yes. Like I mentioned before, most Council members have publicly said that they don’t want to mess around with the originally promised benefits of the UPLA. However, the employer mandate model is only as good as its mandate. Employers have an incentive to deny the benefits to their employees if they can get away with it. So if they can, they will. And we do not yet know what the Council or the Mayor’s plans for enforcing the program would be under the new alternative proposals. So in practice, the benefits provided under an employer mandate may well fall short of the goal. Claim: The increased payroll tax would stall growth and employment in D.C.
Nope. Check this out. According to this thorough analysis of the program by the D.C. Council Budget Office, the D.C. economy will be at least 99.9% as large as it would be without adopting this program. 99.9% not good enough for you? Then consider this: that study does not compare the various financing models – rather, its a comparison between imposing the 0.62% payroll tax to fund the UPLA and not having a paid family leave program at all. That’s (thankfully) not where we are today. We have been promised the benefits of the UPLA through some means – someone is going to have to pay for it – and the question before us now is what form of financing works better. Claim: The social insurance model would make D.C.’s bureaucracy larger. Probably, but…of all the arguments against the social insurance model, this one probably has the most bite. The Washington Post – in what was clearly a measured and balanced piece titled “The District passes an irresponsible, ill-conceived and extremely expensive bill” – pointed outthe many challenges of implementing the social insurance model: D.C. would have to build the administrative and technological infrastructure from scratch (other states with paid family programs built their systems on top of existing short-term disability program systems); estimates for the program’s start-up costs run up to $40 million; the integrated information technology system required to implement the program would be complex; and over 100 new employees — claims specialists, customer service, medical/insurance experts, management, administrative law judges and tax processors — would have to be hired. Sounds complicated. But the D.C. government is committed to providing paid leave. So the issue now is the method of financing. Does the social insurance model create a bigger bureaucracy? Probably. But would the employer mandate model involve some role for the D.C. government? We should hope so. As I pointed out several times, enforcement of the program is critical to the success of the employer mandate model. Someone’s got to make sure that the employers are doing what they are required to do. And that will require government involvement. The hybrid models will still tax employers (a smaller amount) and will create a pool for the small employers. It will also require enforcement and supervision of larger employers. So the D.C. government will have to be involved in all of these scenarios. So the question is to what extent and how much will the D.C. government’s involvement cost in the different scenarios? We don’t know and no one on the Council seems to be addressing this seriously. So there are many reasons to support the original financing and implementation model proposed by the UPLA and too many potential downsides in each of its “repeal and replace” counterparts. Want to let your Council Member know how you feel? Take to social media and tweet at them. Visit their offices and lobby with the DC Paid Leave Coalition. Or better still, show up in person to testify at hearings and make sure your voice is heard. Let’s get paid leave, D.C.! Choking at this stage should not be an option. Check out our new resource, "Social Insurance is a Better Model for Business." It's a short and sweet factsheet on why the the social insurance model of the Universal Paid Leave Act (UPLA) is better than the "employer mandate" model proposed in all other alternative bills. Here is a sneak-peek (spoiler alert! ): Social insurance is a tested model. It is comprehensive; predictable; relieves businesses from administering the benefit; sets a level playing field between big and small businesses; evens out variations between businesses in leave usage; and enhances business growth. UPLA is the best model for DC, and it's the one we already chose! We have an exciting update: Full funding for the Universal Paid Leave Act is in the DC budget, and it passed through the first budget vote today in the DC Council! There will be a second vote in two weeks, and after that the mayor will approve/veto the entire budget. In each of these subsequent steps, it becomes less and less likely that the money is under threat. Unfortunately, our law is still at a high risk of being repealed and replaced. The work isn’t over yet, but we have great momentum to take us over the finish line. Some time in June or July, there will be a hearing to debate replacement legislation, and we want to keep the pressure up to protect the Universal Paid Leave Act. You can sign up to testify! Please sign up here or share this link with anyone you know who might want to: http://bit.ly/LetsProtectUPLA. In the meantime, you can join our weekly phone calls to members of the DC Council. #PaidLeave4DC call-in days happen EVERY Friday! These calls make a difference. Sign up here: bit.ly/PFLcalls1. If you have any questions, feel free to email Alli@DCpaidfamilyleave.org. Councilmember Mary M. Cheh is proposing changes to the DC Universal Paid Leave Act that could exclude small business from the program. Springboard Partners, one of the 8,000 companies that might be excluded under this proposal, wrote this excellent Letter to the Editor that was published by the Northwest Current. It's official: #PaidLeave4DC is moving forward. If we're being honest, the past week and a half has been pretty nervewracking. This was the Mayor's veto window; she had the option to reject our bill, and send it back to the Council for reconsideration. But we're thrilled to say that, as of last night, she declined to do so. This means that #PaidLeave4DC is moving forward, and the Universal Paid Leave Act is going to become law. Many sincere thanks to the Council for bringing the bill to this point, and to the Mayor for hearing the will of the people. And of course, biggest thanks of all to YOU, our community, for your relentless hard work over the last two years. YOU ensured this victory, for all our families, every step of the way - including many last-minute calls and emails this past week. The work's not quite done, though: now it's implementation time, and we're going to secure a strong, robust program. Join us. Hannah & Joanna say goodbye. What's next? 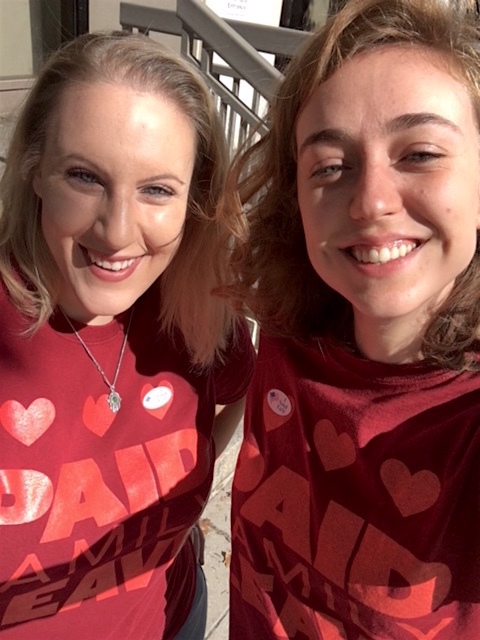 It is time to wish farewell to the badass powerhouse team of Joanna Blotner and Hannah Zoe Weilbacher, who fearlessly and often sleeplessly led the DC Paid Leave campaign. Both women devoted immeasurable time, smarts, and passion, and in turn, made this a fierce and joyful campaign. We would not have won without Hannah and Joanna. Soon, they will hand over the reins over to new leaders who will keep the grassroots pressure on to make sure the city moves forward towards realizing this dream. Read on for Hannah & Joanna's parting words, and send them your best wishes! We LOVED raising hell with all of you. We also know that we won't be far - we care too much about paid family and medical leave to totally disappear from this fight -- especially because JUFJ is taking on the larger, national fight for justice and resistance against tyranny. While our focus will never stray from the needs of Washington, DC, we are more determined than ever that our organizing skills and our amazing community are acutely needed in this terrifying moment. Sign up to be a part of JUFJ's Jewish resistance work against Trumpism. To carry the fight for paid leave forward, we are so excited to formally introduce you to Sarah and Liz! Many of you know them from their organizing with JUFJ. They are both brilliant and fearless. We promise: anything they ask you to do will be fun and meaningful. Reach out to them to get coffee (Sarah here; Liz here), or make sure to say hi when you see them at future JUFJ and Paid Leave events! So what now for paid family leave? Didn't we win? Mayor Bowser could very possibly veto this bill. Her window to do so, though, expires on Thursday. So help us keep the pressure on throughout this week by calling the heck out of her office - every day this week, if you can. Sign up now to make a call. Okay, I did that. What else can I do to support this campaign?? So glad you asked. We are going to need serious people-power to implement the STRONGEST and BEST version of this bill. Join the implementation campaign to make sure this happens. Done! That was easy, too. What else?! We do have one final request. JUFJ is a small and powerful organization. This is a blessing, and it comes with its limits. To be honest, the two of us are headed out the door because there simply aren't the funds to keep us on for longer. We know you are all thinking critically about your giving in this moment. We ask you to add JUFJ to the list of groups who are organizing for power and for progressive change. We can't do anything you count on us to do without the funds. Click here to donate $18 to JUFJ in honor of Joanna and Hannah. We are writing as small businesses operating in the District of Columbia to express our strong support for the Universal Paid Leave Act as adopted by the DC Council on first reading on December 6, 2016. We strongly oppose proposals to replace the UPLA with an “employer mandate” that would require businesses to provide paid leave directly, without the benefit of a social insurance fund. The employer mandate meets the needs of big business in DC, at the expense of small locally owned businesses. The UPLA will allow small businesses to provide an important benefit to their workers, that many currently cannot afford to do, that will improve morale and productivity, and reduce turnover. Paid family and medical leave will be good for our workers – and for our businesses. The UPLA uses a “social insurance model” that would provide a paid family and medical leave benefit to small businesses at a low and predictable cost. (Just $186 a year for an employee making $30,000.) Because paid leave benefits would be paid out of a fund managed by the city, small businesses would be able to pay for replacements when an employee takes leave, without adding to normal operating expenses. By contrast, the employer mandate would be a nightmare for small businesses, keeping small business owners up at night worried about who will need leave next. An employer mandate would be financially risky, because no small business would be able to predict when one or more workers would need to take leave, for which small the business owners would be fully liable. Big businesses can afford to pay out of pocket. Small businesses cannot: A big employer has enough employees to safely predict their annual paid leave costs - when you employ hundreds of people you can rely on averages, and you have millions of dollars in the bank to provide a cushion. Small businesses could be scuttled by just one employee needing to take leave, if they have to produce thousands of dollars on demand. For example, one paternity leave for a middle income employee could cost a small business up to $8,000 out of pocket, perhaps more if they need to hire a replacement staffer. Offering paid leave on our own is not financially feasible. Being required to provide it – with only minimal tax credits to offset the costs – is not right. Businesses don’t need to be told to provide paid leave - they need a real way to be able to offer this life-saving benefit at a manageable, predictable cost. Without government leadership, paid leave will remain out of reach of thousands of DC small businesses and families. Today’s vote demonstrates the power of families who united across the District around the shared need for vital benefits. Now it’s up to the Council and Mayor to take the final step to make it a reality. October was Breast Cancer Awareness Month. While many people were wearing pink ribbons, as a breast cancer survivor I was doing something else: advocating for paid family leave in DC. DC Paid Family Leave Coalition Response To Revised Universal Paid Leave Act: Bill affirms need for progressive family leave, but eliminates crucial medical leave coverage. The clock is ticking, and pressure is mounting for the D.C. City Council to vote on the Universal Paid Leave Act of 2015—a bill, that, if approved, would become the most progressive paid leave law in the country. #WithHer, but is Mayor Bowser #With DC’s Working Families? Mayor Bowser is proudly #withher, and once again reaffirmed this at the opening of the DC for Hillary office opening last week. But given the opportunity to be at the forefront of a growing movement that is a centerpiece of the Clinton presidential bid—the movement for paid, gender-neutral, and job-protected family leave—Mayor Bowser is dragging her feet. See pictures of our epic rally for #PaidLeave and #JustHours!